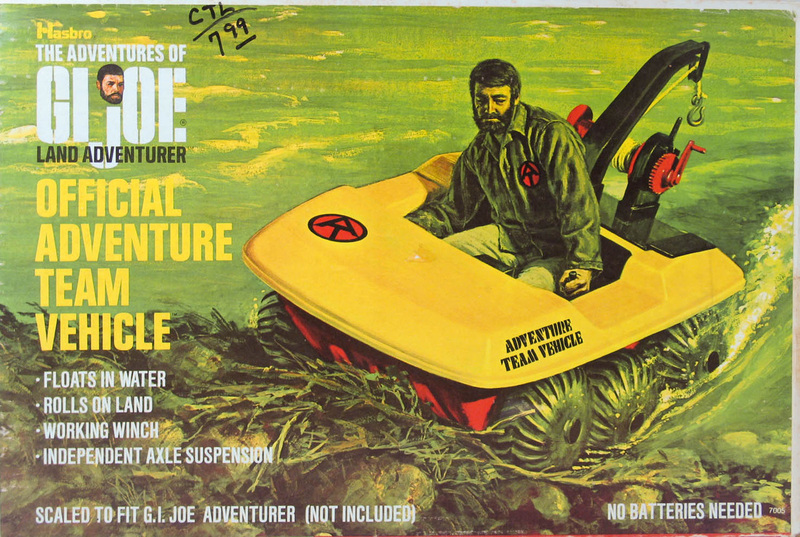 Based on the six-wheeled Argo ATV, the Adventure Team Vehicle (7005) was incredibly popular and available both as just the vehicle and as part of two different adventure sets: Secret of the Mummy's Tomb and Recovery of the Lost Mummy. The same basic body mold was used to create the 'Delta X-9 Communications Vehicle' for Fate of the Trouble Shooter and the ATV for Trapped in Coils of Doom, though these latter two are tracked versions and have the holes for a windscreen and grille vents to which a front panel with simulated headlights can be attached. The version with grille vents was also released in yellow in 1974, likely in the KFG box version of Secret of the Mummy's Tomb, and there is a rare variation of the vehicle molded in Trouble Shooter red, though some of these may be 'customs' created by Joe fans. If you have one of these that came with its original box, please contact me. Below, the 1974 version that came with the KFG version of the Mummy's Tomb set.